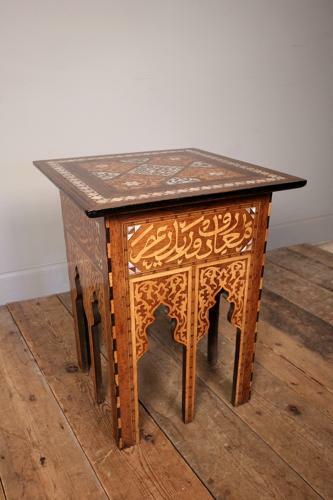 A beautiful Syrian Inlaid Moorish Table in the Liberty & Co style. This decorative antique table profusely inlaid in Abalone, mother-of-pearl, Ebony and exotic hardwoods. Having a square top and raised on shaped base. Superb condition throughout. Circa 1900.